Highlights include: 3-hour snorkel tour from Ambergris Caye Cruise the clear Caribbean waters and snorkel amid coral formations See colorful reef fish and other aquatic life in Hol Chan Marine Reserve Spot stingrays, sea turtles and brown nurse sharks in Shark Ray Alley What You Can Expect Snorkel in Belize Belize is famous for its remarkable snorkeling sites and diverse sea life. With a name that means “Little Channel” in Maya, Hol Chan Marine Reserve was the first such designated reserve in Central America and is located among the second-largest barrier reef in the world. Just a 15-minute ride by motor boat from Ambergris Caye, Hol Chan will be the first stop on your snorkeling adventure. Thanks to dedicated conservation efforts, this area boasts a wonderfully healthy and diverse population of marine life, including 160 different species of fish. You’re likely to spot large schools of snapper, grouper, and jack fish darting among the impressive coral formations, as well as larger creatures like sea turtles and stingrays. 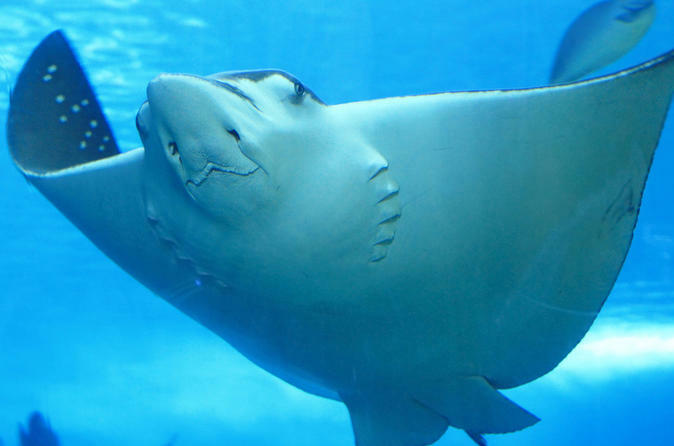 Hop back aboard your boat for a quick ride over to Shark Ray Alley, a shallow channel in the reef where these two bottom feeders are found in abundance. Swim among gentle stingrays, with wingspans up to 4 feet (1.2 meters), as well as harmless brown nurse sharks that can reach lengths of more than 9 feet (2.75 meters). After getting your fill of these marvelous marine animals, you’ll be transported back to Ambergris Caye and Mahogany Bay Resort. Snorkel Excursions start at $50 + tax and service charge.